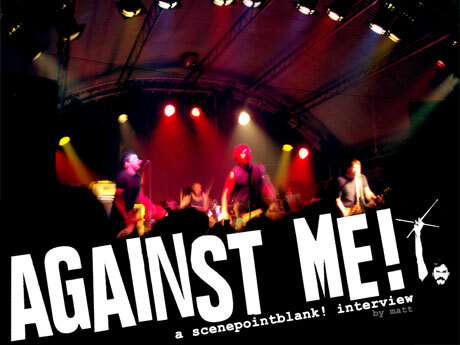 Features › Interviews › Against Me! Since their formation, Against Me! have enjoyed a somewhat cult following in the punk scene, and tend to split audiences down the middle in terms of opinion. 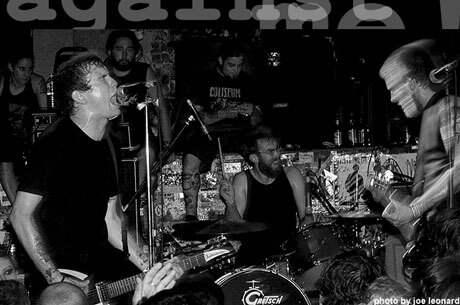 Their recent signing to Sire Records attracted a lot of attention and many "fans", already feeling alienated by the band's previous signing to Fat Wreck Chords, denounced the band as sellouts. Anyone would expect this to leave a band hating their so-called fans and consequently their music, but when SPB writer Matt sat down with Against Me! 's drummer Warren Oakes, it seems this is far from the case. Scene Point Blank: You got quite a reception when you were setting up before the show - how does it feel to be a celebrity? Warren: It's like.. I'm the guy with the big beard, and it's like a caricature in a way. It's one of those things where it's like, I dunno, if they were all screaming like (sarcastically) "You're a really good person! ", that's one thing, but it's like "You have a big beard and I know who you are", you know... I don't take it to heart too much. Scene Point Blank: Have you ever been recognised when out? Scene Point Blank: Could you see that kinda thing becoming annoying? Warren: Um... It seems like a really distant thing, because relatively speaking, it could probably happen. So if I ever have to start worrying about that.. We'll take it as it comes! Scene Point Blank: That makes me think of the pictures I saw on your site of the shows you played with Green Day, in these huge stadiums to thousands of people. How do you adjust from playing small shows like this to something as huge as that? Warren: From our perspective, a show like that, you just have to keep it all relative. The people there are like, that was maybe the one show a year those people go to, and they're the kind of people where if they know a song well from hearing it a thousand times on the radio, then they'll rock out to it, but otherwise, they're not like a discerning music fan, they're not breaking it down or digesting the material they're not familiar with. It's kinda like, you get a lot of stunned looks, like "Oh, these people are making noise with those instruments right in front of me?". It's a very different experience, and the majority of people who are here tonight probably go to a show every week, it's really different. The people who are actively engaged in the music that they listen to, and always searching for new things and discussing music.. that's great to have that concentration of people that are all like... it matters to them, you know. If you fill up a bigger space, it's gonna dilute. Scene Point Blank: Does that make it harder to play those shows? Warren: It makes it so that you have to seek the satisfaction in a different way, like.. a show like this, for me, I have the monitor, the sound monitors, so I can hear if everything sounds right, but more than that, I use the visual monitor of looking out and seeing people nodding their heads and smiling and dancing. And if I'm getting that response, I know that what we're doing is working alright. And so, a show like that, your visual monitors aren't gonna do anything for you, you just see a sea of blank faces, so you have to listen, like "are we playing this well? ", maybe kind of string all our songs together, we're not gonna sit there and tell jokes, we're just gonna rock it out, and if a couple of people walk away going like "oh, I wanna check that out", that's the best thing. And you have to be just satisfied with your performance, the four of us onstage, and not dependent on what sort of a response you're getting. Generally, we do really depend on the crowd on the give-and-take reciprocation of the show, that's what makes me feel more pumped after a show than before, instead of drained. Scene Point Blank: How's the UK tour been going so far? Warren: Well, we started... I had previously used "UK" to describe Ireland in the past, which people are very funny about.. so we started in Ireland, Northern Ireland, then Scotland, and then England for the past few days now, and all the shows have been really great. We're with Murder By Death on tour, and we're really big fans of their music, and fans of them as people, so they're great travelling partners. Scene Point Blank: It was St. Patrick's day yesterday, and I see you're drinking appropriately (Warren has a Guinness). Did you celebrate? Warren: Yeah, we were in Sheffield. We actually were in Manchester the night before that, so like when it turned midnight, it was technically St Patrick's day, and that's when we actually pretty much celebrated it proper, we celebrated a little too much to really do much in Sheffield. A couple of the fellas went out, I ended up just calling in an early night with a bottle of Jameson and a couple pints.. doesn't sound like much of an early night I know, I guess it's all the pace that you're drinking at (laughs). Scene Point Blank: You have some remixes coming out soon on Fat Wreck Chords - why are you releasing them with Fat rather than your new label Sire? Warren: We still have a really great relationship with Fat, and we're still excited about working with them. We're probably gonna do a couple more releases with them. We've been really fortunate to be able to work with some of the greatest labels that exist right now, from Sabot, that Jordan does, to Plan-It-X, to No Idea, which is a really respectable label, and Fat, and we're looking forward to working with Sire as well. They all have really great rosters and they're really dedicated. The remixes: there's one that's coming already for Don't Lose Touch, it's like a single with the remix as the B-Side, and then the next one is for From Her Lips To God's Ears (The Energizer), and then there'll probably be eventually one more, like a remix of... we're not exactly sure what song. Scene Point Blank: Adrock from the Beastie Boys is doing one; how did you hook that up? Warren: It was kind of like.. we're all fans, and he heard we needed people to remix stuff, and we know somebody who knows somebody who knows him, so we put the word out, and he checked out the song and he was up for it. Words by Matt on Oct. 16, 2010, 11:09 a.m.
Posted by Matt on Oct. 16, 2010, 11:09 a.m.